It has been 24 hours; the wonderful scent of raw fuel and incinerated tires has finally been expunged from my lungs, but the smile remains. 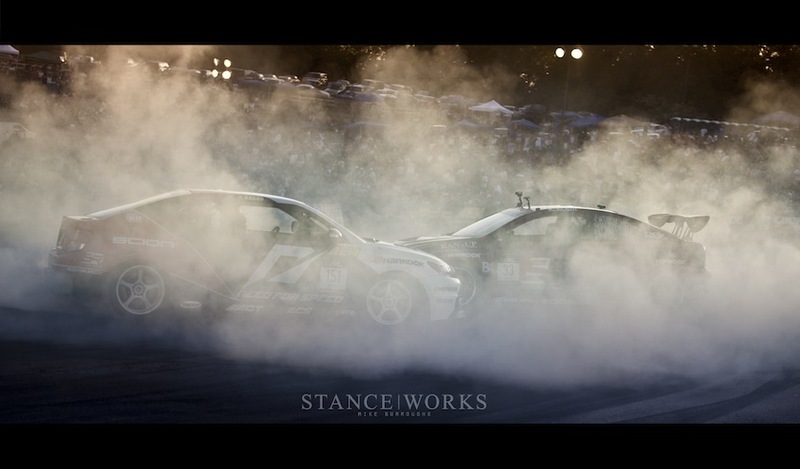 Formula Drift: Atlanta was all-out this year, leaving nothing to be desired. 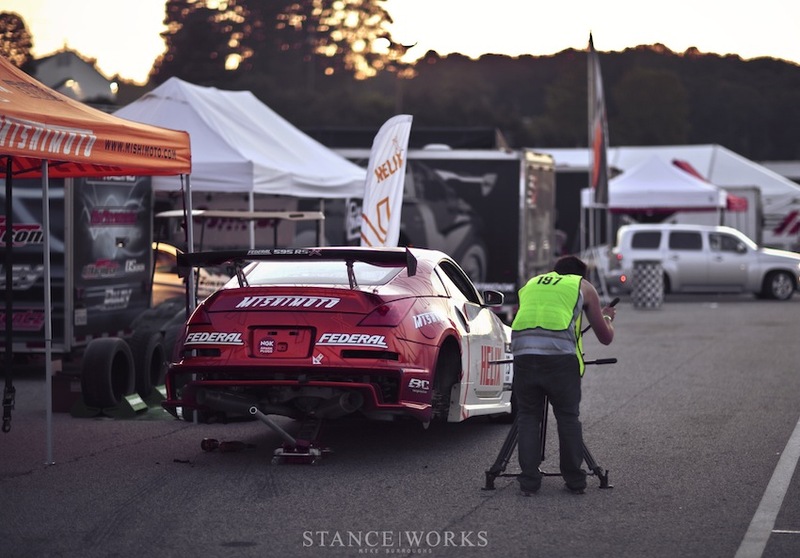 The competition at Formula D doesn't fall short; it's cutthroat to say the least, with the hardest part being the big names versus the privateers... the guys like you and I, putting cars together in their garages with cash from their own paychecks. That's not to knock the big names either. 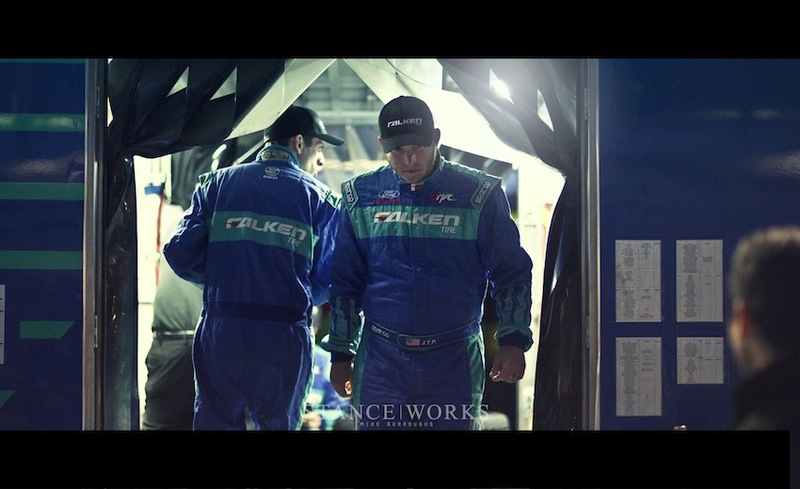 Teams like Falken and Mobil 1 came out in full force this weekend with cars that seemingly have enough power to turn the earth backwards.... and that's obviously appealing. 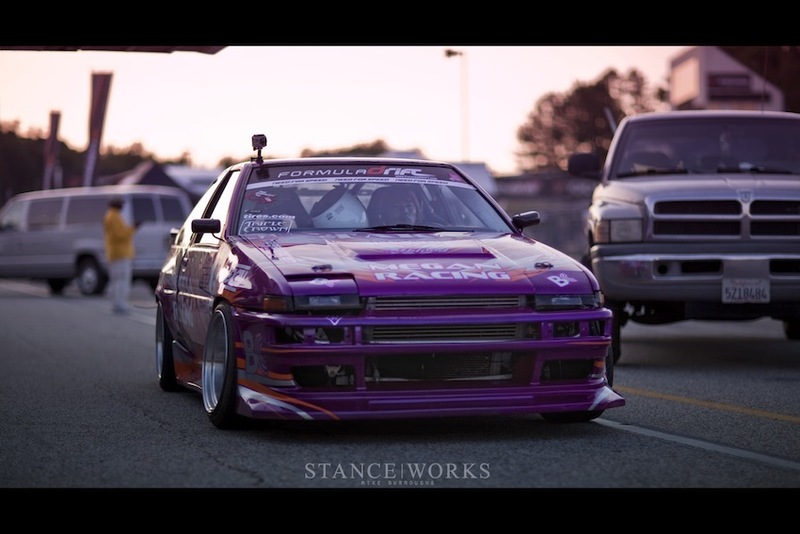 If you've never been to a Formula Drift event, it's something unique. Everyone is welcome to mosey about the paddocks, not only walking within inches of the cars they've grown familiar with, but they're also right there next to the drivers who couldn't possibly be any nicer to their fans. I found myself chatting away on more than one occasion this weekend, talking about the this-and-thats of their car, eager to learn more about what makes these radical cars tick. The paddock is a tire spinning haven, with the technicolor brilliance of those paint jobs we've only seen on the internet in TV screaming at you, nearly burning your retinas. Crowds gather around cars as they're started throughout the day for various testing and tuning. Some teams had the luxury of working under unfathomably large awnings and shades, while others slaved under the hot Atlanta sun, all working equally hard to prepare their cars for the next round of tire roasting. And of course, amid the drivers, cars, and crowds, you might find a familiar face or two. Your "internet celebrity" of choice was bound to be around. Abbitt was always at the ready with his tripod this weekend, and of course, Linhbergh and Roegge were sneaking their way through the masses. I found my way to the starting grid, possibly the best part of the entire event. It's a shame not everyone gets to experience it. Having credentials and media access has it's up-sides, it's impossible to get any closer to the action. The drivers line up, waiting for their chance to run the course. The tension builds as the final rounds get closer and closer. Adjustments and changes are made at the final second, amid cars doing their best to keep their tires hot by launching and burning out just inches away. Nightfall only made it better. The smoke was illuminated by the dozens of lights that lined the asphalt, creating an unparalleled atmosphere. 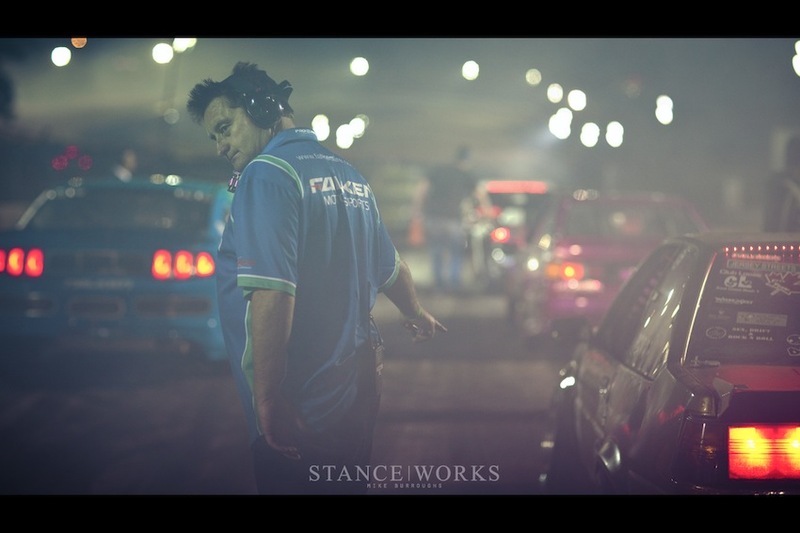 Headlights and taillights pierced the smoke, making it a photographer's dream come true. Day two brought on the top 32 and then the top 16, and as you could imagine, countless bumpers were flung from their charriots as zipties begged for mercy. More than one car met an unfortunate demise, but as expected, several dedicated drivers found their way back to the starting grid to give it one more go. The further we got into the competition, the closer the drivers got to each other. 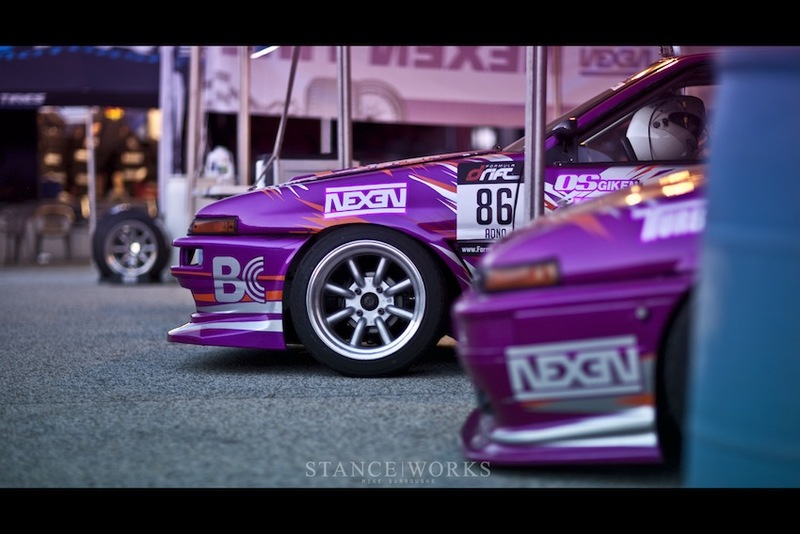 Gaps between cars went from "close" to what could only be described as a delicate paint swap. 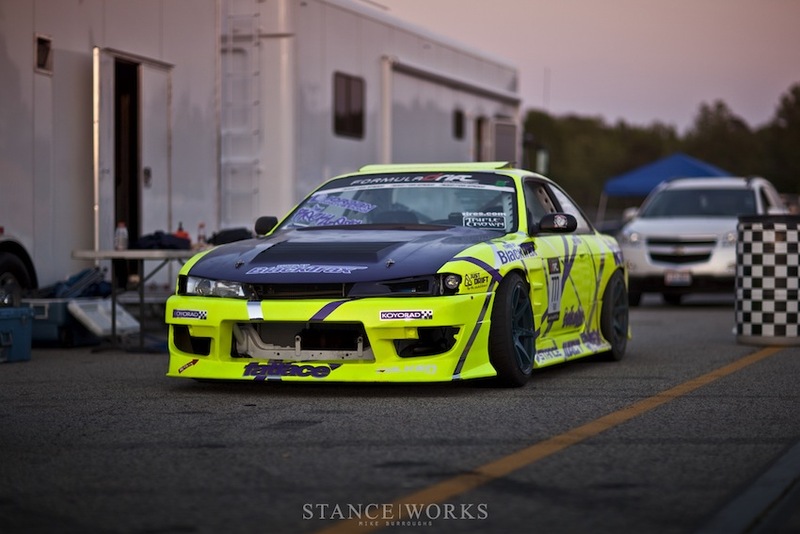 Matt Powers and our friends at SpeedHunters had their S14 sporting this season's new livery, and as expected, Matt put down some serious runs. We couldn't help but cheer him on, and while he didn't make podium, I can say with confidence the best run of the evening was made by him during a "track clearing" run. Also in the top 16 was Walker Wilkerson. It's exciting to see the young guns running against the names we've heard about for years. Walker put down some fantastic runs on Saturday evening in one of the few non-V8 powered cars present at the event. It goes to show that perhaps there is a bit more to the recipe than displacement. 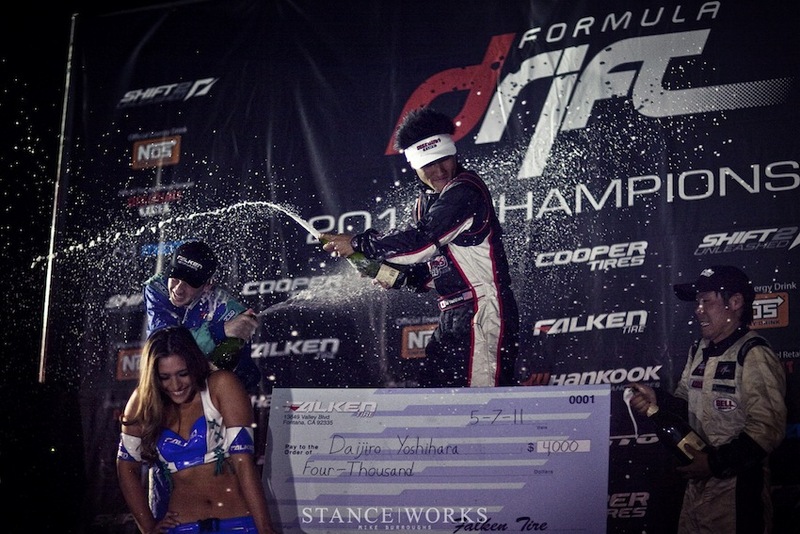 In the end it came down to the final two, with Dai Yoshihara taking home the top spot, making it two of two podium finishes for the season. All in all, the weekend was outstanding, and formula D wouldn't be what it is without the participation of both the drivers and the fans. It's much more communal than any other motorsport I've experienced. At the end of the day, the drivers are just like you and I, some even more than you'd expect. It's a sport entirely about having as much fun as possible, and it seems as though no one forgets it. 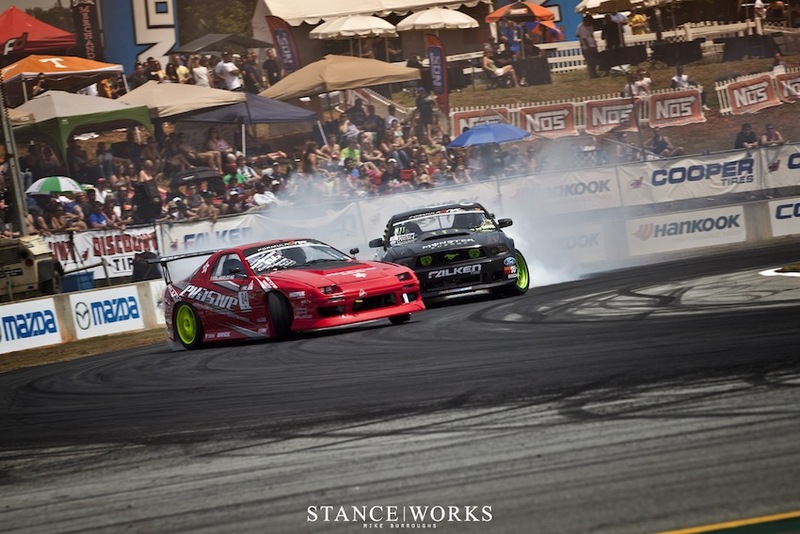 So if you have not been to a Formula D event, do yourself a favor and head out to one this year. It's entirely worth it... Maybe we'll see you in Palm Beach!